Now for the tunic itself, the tailor had stitched beautifully the yoke and sleeves to the tunic, with the neck pattern . I wanted a deep neck for the back, with a crossed cord made with the green fabric. Whenever other people made comments about the design or embroidery, it was either the tunic was good or the embroidery was good, or else the colour combination was nice.It is very interesting to see how each one’s taste differs. Very rarely, the tunic, design , embroidery, colour coordination, all together would be a success. This tunic is one of that kind. This yoke is part of the printed voile tunic about which I had detailed the pattern on the post here. 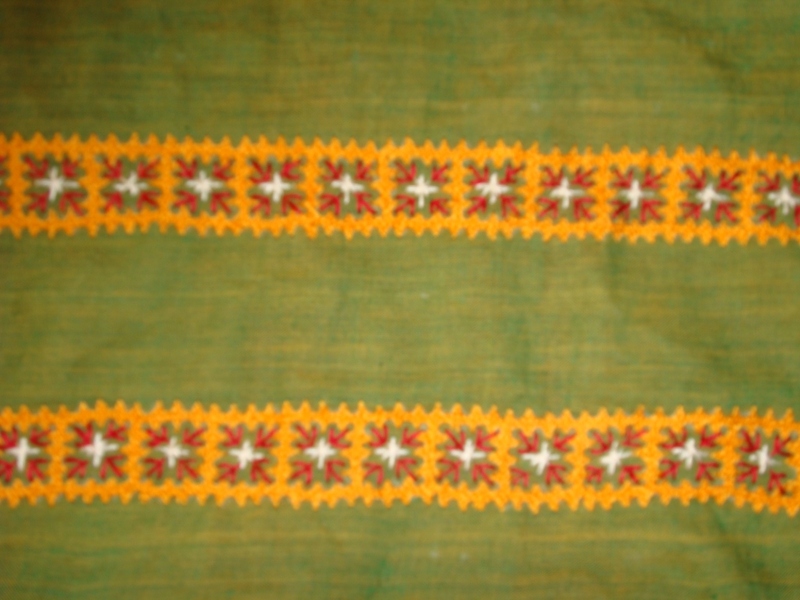 The yoke pattern is also continous kutch embroidery. I added few more stitches to embellish this design. A small kutch in dark orange in the middle. Here I used the kutch embroidery with long tail and not the curved one. Herringbone in medium green thread,stem stitch in cream thread. To enhance the inside of the small squares left bare by the yellow kutchwork-fly stitch in red, and double cross stitch in cream were done.This works good as a decorative stitch too. On my next post,I’ll post the picture of the yoke on the tunic. This tunic I started a few months ago. 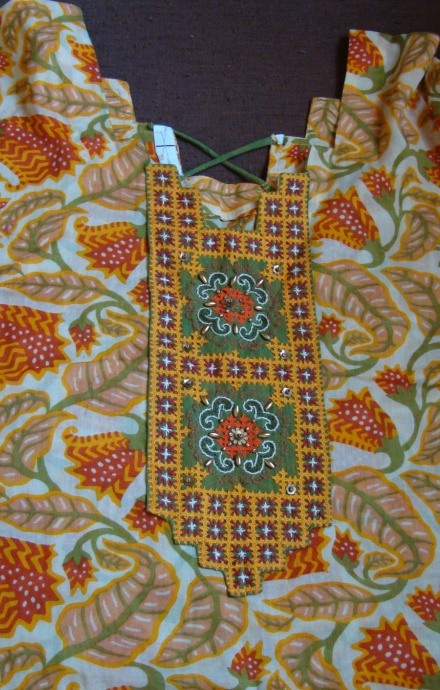 The tunic fabric was in cream printed with green, yellow , orange and red colours. 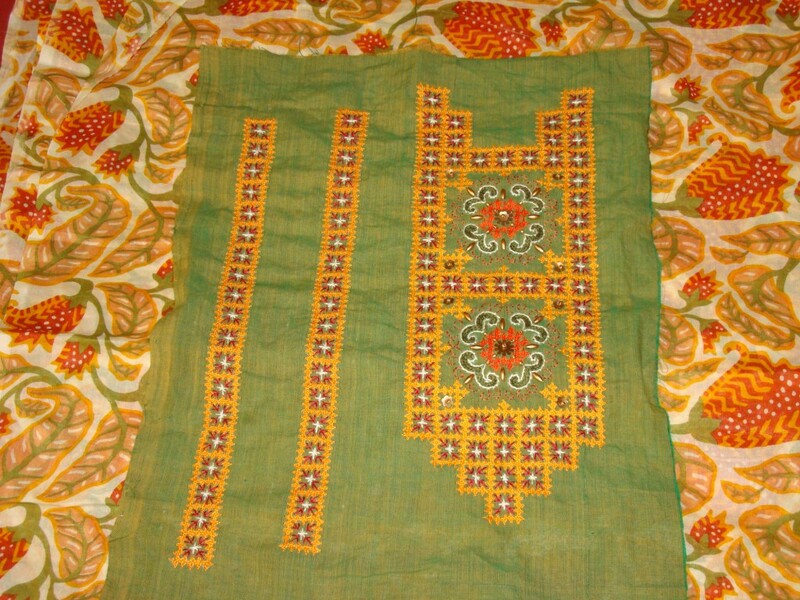 I chose a light green fabric for the yoke, sleeves and salwar[Indian pants]. I wanted to do a continous kutch embroidery pattern, and some fillers with other stitches. 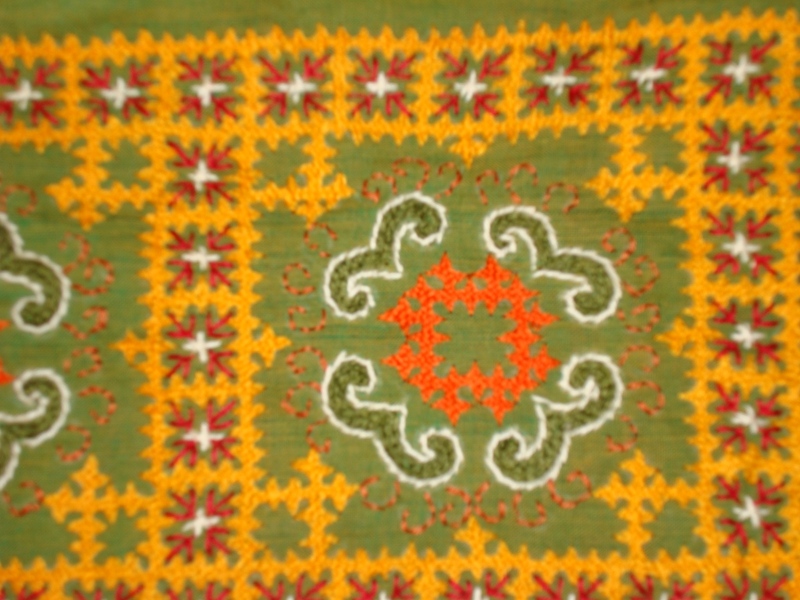 The continous patterns in kutch embroidery, is done in one thread. A variegated thread can be used, which will have slightly different effect . When one colour is used , it is sure that, only that colour will dominate the whole pattern. I wanted to study and work this aspect in this tunic piece. With the green base for yoke, I chose yellow for the kutch work[because that colour will accommodate red and orange for filling patterns]. The other colours were- red,orange, copper orange, medium green, and cream. I’ll continue with the yoke on my next post.